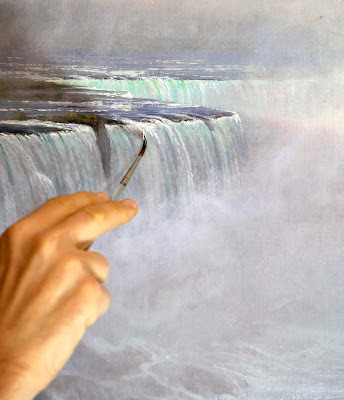 Christy's "Signing of the Constitution"
Landscape painter Thomas Kegler recently completed a three-year project to paint a panorama of Niagara Falls. He documented the process on an instructional video with a running time of more than 8 hours. It's a big painting, more than 8 feet wide, and the video covers everything from the concept sketches to building the frame. Kegler produced it all, and he took time out to answer a few of my questions. J.G. 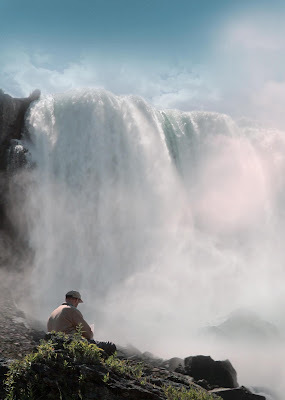 What feelings went through you when you got close to Niagara Falls? Thomas Kegler: Having grown up near Niagara Falls and experienced it many times, I frankly was often turned off due to the commercialization and touristy atmosphere. 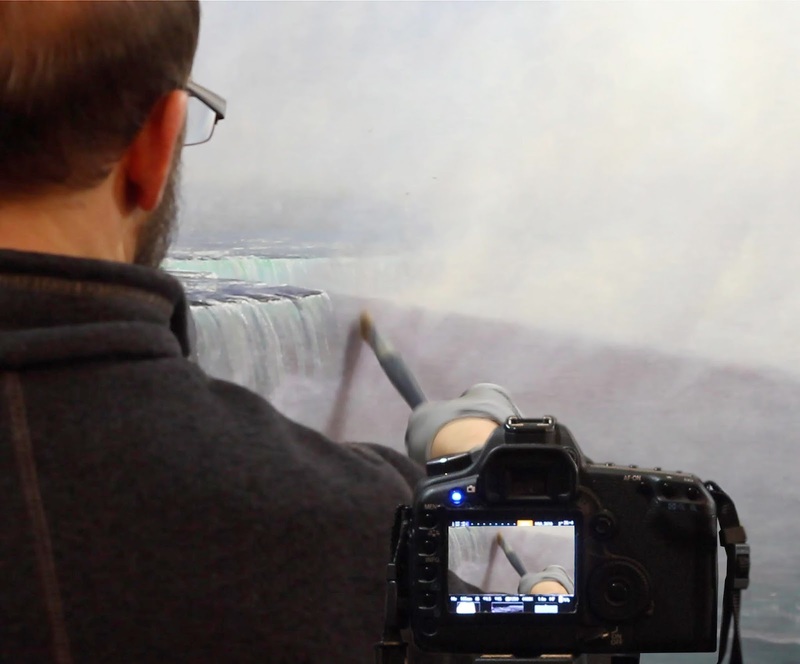 As I embarked on this quest, I began to look at the Falls differently – through the lens of an artist. Once I was able to filter out the human distractions and focus on the majesty of this natural wonder, I was in utter awe. This especially hit home when I began the long-duration drawing and field paintings and got up close and personal with the Niagara River. The sounds, smells and sensations transfer you into a trance when you just sit and watch. J.G. Do you think those feelings are different from those of someone 100 or 200 years ago? T.K. I think the feelings and emotions that Niagara can evoke are likely the same as they were back when the Hudson River School painters visited in the mid 1800s. In our modern society we are conditioned for immediate gratification sustained with a rapid paced life. Thus, it may take a bit more effort on our part to slow down and really experience what the Falls has to offer. J.G. How did you deal with the precedent of Frederic Church's famous paintings of Niagara? T.K. Church had set the bar very high and I certainly was influenced by what he was able to capture. There was a part of me that at first was reluctant to take on this challenge. I intentionally chose a very different vantage, time of day, and emotional charge. This helped me design the painting with a fresh approach. J.G. How did you decide on the length of the video? T.K. The amount of raw footage I had to work with was over 130 hours. My initial goal was to edit this down into a 5 hour video. Half way through the editing I realized that in order to convey all I intended, I did not want to limit the length of the film and jeopardize any pertinent information. J.G. Were there aspects of the video-making process that turned out to be more difficult than you had anticipated? T.K. Since I self-produced the video, my most significant hurdle was to balance the emotional and spontaneous aspect of painting, along with the necessity of managing 4 running cameras. This meant that I would need to adjust each camera every 10 minutes as I moved across the canvas while painting. This took a great deal of diligence and patience to interrupt the creative act to deal with the cameras, and then get right back into it. I did hire some talented videographers to help occasionally, but the majority of the camera operation was overseen by me as I painted. J.G. Thanks for mentioning me on disc 2! What did you make your maquette out of? T.K. The Maquette was made from foam, plaster gauze and acrylic paint. J.G. You mentioned that you were inspired by Ruskin's view of God as manifest in nature, and you quote scripture in the title. Is the spirit of the divine that you experience when painting landscape distinct from the spiritual life that you encounter in church or when reading scripture? T.K. My faith and spirituality are manifested in my everyday life and my work and I try to not separate them. I look at my paintings as devotional works that celebrate creation. Having said that, the spirit I experience when painting is different and often more tangible than when reading. I invite the spirit to bless my hands and work through me. Often I feel my works seem to paint themselves. J.G. In your timeline you indicated that it took about 1000 days to do the whole project—preparation, painting, frame, and video. How do you feel now looking back on the scale of the project? T.K. The first reaction when the final cut was delivered for duplication was a big exhale. I still see aspects that I would change or do differently, but overall I am pleased with the final result. I knew from the start this would be a long term endeavor, and thus I did not plan a final deadline initially. I wanted it to be just right. Nevertheless, it took twice as long as I anticipated. J.G. Was it emotionally and financially rewarding? Do you want to keep doing other big projects? T.K. This project was by far the most challenging and rewarding endeavor I have attempted. The challenges were profound - both from the standpoint of the sustained focus for such a long time, as well as the expenses involved in funding your own publication. Emotionally, I am very gratified. I trust that the financial success of the video will be evident in the long term. J.G. What will be the fate of the painting? Will it be in a private collection, or will it be visible in future exhibitions? T.K. The painting is currently on exhibit at the Castellani Art Museum on the campus of the Niagara University along with about 15 other works related to Niagara Falls. This exhibition runs until January of 2018. There is discussion of evolving this into a traveling exhibition to other Museums. I would like the final resting place for this work to be in a public space...ideally the Castellani Museum itself. We are currently seeking a patron to purchase the painting for the Museum. A portion of the proceeds will go to the Buffalo Niagara River Keeper organization and the Western New York Land Conservancy. Castellani Art Museum: "Painting Niagara: Thomas Kegler"
I love Niagara Falls, been many times and each time I am in awe of the power and nature there. He did a wonderful job capturing the falls and power the place has.